So anyway. You are probably wondering what will yellow week consist of. 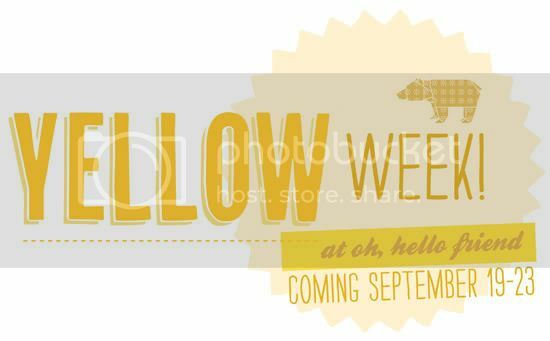 Well, there will be a yellow (online) pop-up shop, lots of yellow inspiration, deals, diy, and lots more! You won't want to miss yellow week, so be sure and join us on September 19th for lots of yellow fun. Love yellow!! Would love to see it represented in home design, there are so many fab decor items all with a lovely shade of yellow. I've been totally into that color too lately, been putting together a fashion guest post and both the jacket and shirt have that mustard-y hue. Love! Yellow has been my favorite color since I could walk! Other girls loved pink and purple, but not me....yellow all the way!! Ooh, awesome, I am so excited! Currently re-doing our bedroom in grey and probably yellow as an accent. Love it! My favorite color too. Yay! OMG this is awesomeeeeeee. I am a fan - you know that! :D I love this idea and can't wait for it!!!! Yellow weeks like so much fun, I can't wait! Also, I've been meaning to tell you, I always love your graphics, they give me inspiration! What program do you use, Photoshop, Illustrator? Whhooo hoo! I'm so obsessed with yellow (as you can tell here: http://www.pecklife.com/blog/2011/08/you-had-me-at-yellow.html) This sounds like fun!!!! A whole week of yellow? It's so you, Danni. I can't wait to see what you have in store! amazing! since i was a kid, yellow was my favorite color...NOW it's getting the press it deserves! will you do a post on yellow paired with different colors? its so versatile...sunshine and aqua, lemon and eggplant, butter and charcoal, golden and chocolate...the list could go on forever!! I associate yellow with madness. Yay yay yay! Yellow is my favourite!